Fusion offers a step-by-step, biblically grounded, tested, and proven plan for establishing a relationship with newcomers that ultimately prompts them to become fully developing members of our churches. This innovative, practical guide is full of how-to information, testimonials, examples, and self-assessment tools. Engaging, informative, and immediately applicable, here is help for setting newcomers on the path toward true life transformation and spiritual maturity. 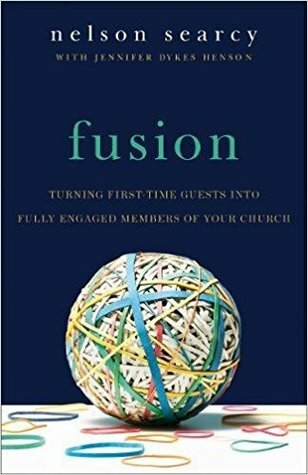 "Fusion" is a great church tool for leaders. This is perfect for pastors. The aim of the book is for those in ministry trying to engage first time guests into returning back to their church for a second and third time. The author basically uses second-time guest relationships a building block for opportunities to have them become regular attendees. He then encourages a membership class to move attendes to further their level of commitment to the church. One note I must point out, is that this system's structure is based on the fact that those who are being disciples are being discipled out of community in a small group setting. While he offers great advice, not every church has these resources of team members to do this. I give this book 4/5 stars. A favorable review was not required.